Venice 1681. Glassblowing is the lifeblood of the Republic, and Venetian mirrors are more precious than gold. 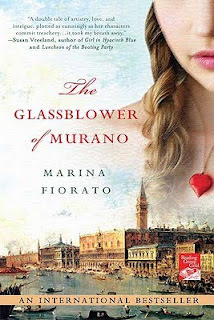 Jealously guarded by the murderous Council of Ten, the glassblowers of Murano are virtually imprisoned on their island in the lagoon. But the greatest of the artists, Corradino Manin, sells his methods and his soul to Louis XIV of France to protect his secret daughter. In the present day, his descendent - Leonora Manin, leaves London for a new life as a glassblower in Venice - only to find her fate inextricably linked with her ancestor's dangerous secrets. As Corradino Manin looked on the lights of San Marco for the last time, Venice from the lagoon seemed to him a golden constellation in the dark blue velvet dusk. I happened to stumble on this novel accidentally while searching on Amazon for Italian fiction. This is the first book of Marina Fiorato's that I ordered. The moment I finished reading this book, I went back on Amazon and ordered another. Marina Fiorato is part Venetian part English. In this regard, the novel parallels her life. It is obvious through her writing that she is highly familiar with Venice, its history, its streets, its culture. The story she weaves has plenty of intrigue and captured my interest from the very start. She delves deeply into the way of life for glassblowers and the process is well described. Immaculately researched, and highly accurate, this is one novel that should be on the book shelves of all who love Italian history. Brava Marina! No wonder it's an International Bestseller! This book has been on my TBR list for a while, mainly because of the unusual setting. Oh, this sounds excellent. I've been fortunate enough to have visited Venice several times - it's a place where past and present blur into each other. Thanks for the recommendation. This is now on my TBR list. This title is great and well, its really a "Classic" as well. The interesting part is "Murderous Council" and lady with dangerous secrets.